It’s that time of year again…Easter! A time for joy, religious reflection, fluffy bunnies, and of course candy. This year, Easter falls on April 20th and we want to make sure that you’re prepared and have the best house warming decorations. For a traditional, stylish, and cute Easter welcome, take a look at the Floating Easter Eggs flag. This flag displays beautiful, vivid colors that are sure to brighten up your home and make your entrance way unique. This flag features a ribbon-like banner that runs over the top reading “Happy Easter”. There are eggs of different sizes, colors, and patterns tied to ribbons that are dangling down the flag. This flag was printed in the USA and measures 28″ x 40″ and is listed at $18.15. If you’re looking for a more religious Easter flag, we have those too! The new Easter Cross garden flag is smaller compared to the ban ner flag and measures at 12″ x 18″. This garden flag continues to have the stunning, vivid colors featuring a cross with lilies resting on it and inspirational Bible quotes remain in the background. This garden flag is listed at $9.09. That’s a great steal! However, maybe you’re looking for something a little different? 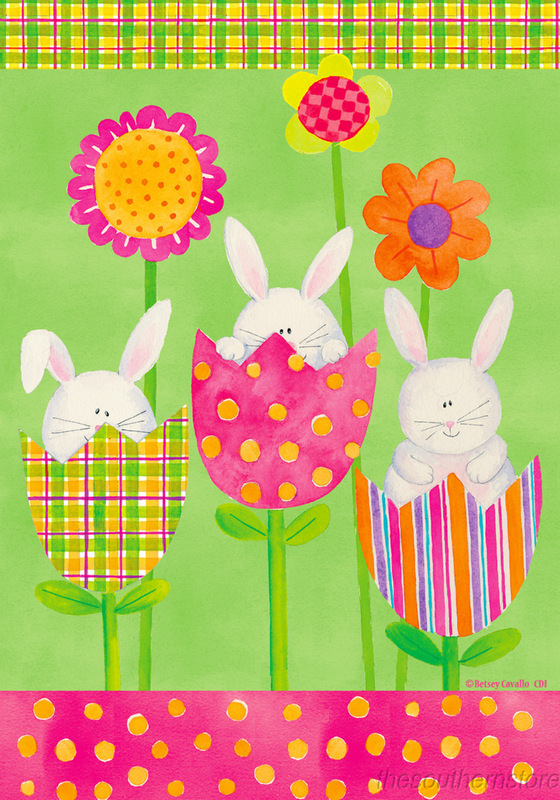 How about flowers and bunnies to celebrate that spring is finally here? Our brand new Tulip Bunnies welcome flag is sure to please. This flag features some plaid printed on the top border and polka dots on the bottom border. There are adorable bunnies that are popping out of tulips in the foreground in front of some flowers in the background. This flag is listed at $18.15 and measures 28″ x 40″. You can’t go wrong with this flag! Check out the rest of our Easter flags: here.